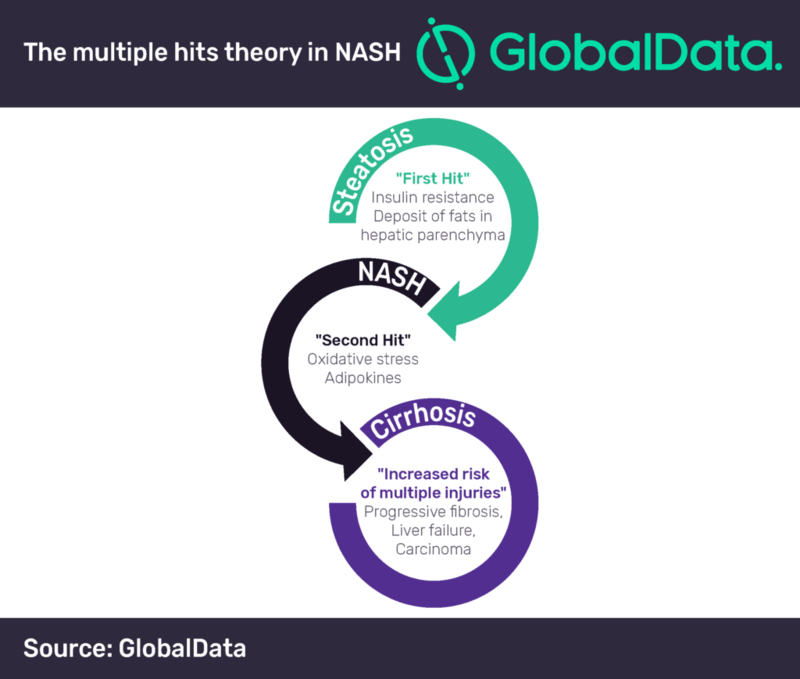 Despite its failure in the Phase III STELLAR-4 trial, Gilead Sciences’ lead non-alcoholic steatohepatitis (NASH) drug candidate, selonsertib, may still have a place in NASH combination therapy strategy, according to GlobalData, a leading data and analytics company. On 11 February 2019, the American biotechnology giant announced that selonsertib did not meet its primary endpoint in the pivotal Phase III, placebo-controlled trial investigating its safety and effectiveness in compensated cirrhosis (F4) patients. Specifically, neither of the selonsertib treatment arms showed a statistically significant 1-stage or more histological improvement in fibrosis without worsening of NASH compared with placebo. A successful treatment for NASH has remained elusive to drug developers due to challenges presented by the progressive and multifactorial nature of the disease. The ‘multiple hits’ pathway is often used to describe NASH pathogenesis and captures this problem well. As a result of the disease’s underlying complexity, key opinion leaders (KOLs) interviewed by GlobalData have emphasized that drug combinations with complementary mechanisms of action—such as those of anti-inflammatory, anti-fibrotic, and hepatic fat accumulation inhibitors—will likely be the best approach to treating NASH. According to KOLs and payers interviewed by GlobalData, an FDC for NASH would enable combination therapy with a single prescription and would likely provide Gilead with pricing power over competing regimens where the individual components are marketed by different companies and are therefore priced and prescribed separately. In a market like NASH where future cost concerns are rampant, a clinically-effective FDC could quickly rise to the top even if it is not first to market. Given the inherent advantages of an FDC for treating a highly prevalent and complex disease such as NASH, GlobalData forecasts that a Gilead FDC could account for 15% of the global NASH market or more, depending on its clinical profile and pricing.